When writing blog posts and maintaining your website, it’s important to make sure that your site doesn’t have broken links or missing images. One great plugin for checking your links is Broken Link Checker. Click Install (and confirm in the pop-up dialog), and then Activate Plugin. 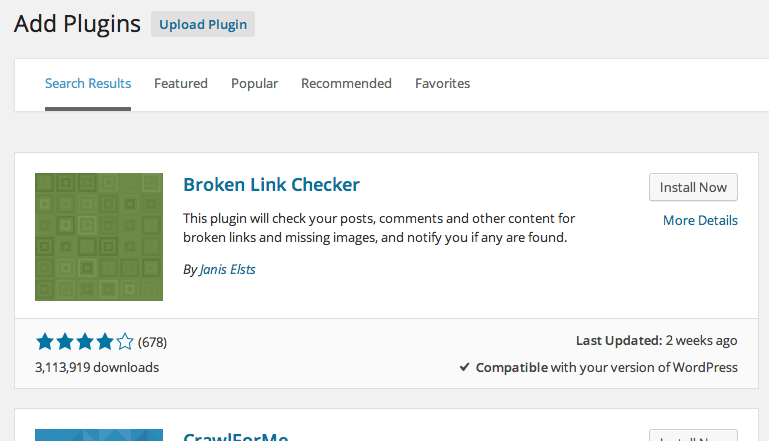 Activate the WordPress Broken Link Checker plugin. Access the settings under Settings > Link Checker. Access broken links under Tools > Broken Links. After you have installed and activated the plugin, you can configure it from Settings > Link Checker. In the plugin settings you can set how frequently to check existing links on your blog, as well as which items the plugin should check (posts, plugins, comments, blogroll, etc), and optionally set a notification e-mail address if you want an email report with any broken links. Note that you can access various settings using the tabs at the top of the screen, and you can review broken links using the Go to Broken Links option in the upper-right corner of the settings screen. For more information, refer to the Broken Link Checker support forum here.